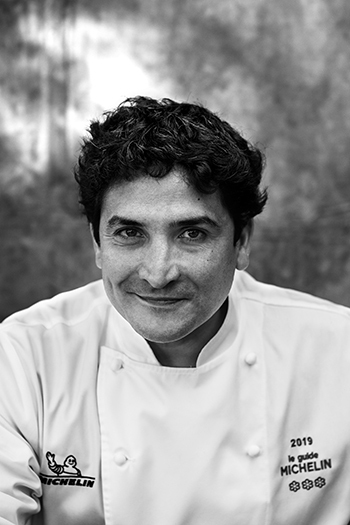 Italian-Argentinian chef Mauro Colagreco leads the kitchen at Mirazur in Menton, France, which just received three Michelin stars in the MICHELIN Guide France 2019 Selection in January this year. The restaurant is uniquely located between sea and mountain, along the Riviera and just a few minutes' walk from the Italian border. Originally from La Plata, Argentina, Colagreco dropped out during his sophomore year at National University of La Plata's School of Economic Sciences to pursue his love for cooking. He went to France in 2001 to first work with Bernard Loiseau. He later worked under Alain Passard at Arpège and then Alain Ducasse at Hotel Plaza Athénée before spending a year at Le Grand Véfour. Though some would describe his cuisine as Mediterranean, Colagreco "has forged a style of his own," per the restaurant's website. Drawing on his culture and culinary mentors, he is "inspired by the sea, the mountains and the fruit and vegetables grown in his own gardens [to invent] colorful, pictorial dishes that play with textures and bold contrasts." His food emphasizes local ingredients, produce and terroir, working with small producers, fishermen and farms. He has five people tending to two gardens that supply about 25% of Mirazur's produce. He also has an orchard and herb garden with 150 types of herbs and edible flowers, 35 tomato varieties and citrus trees that grow a famed local lemon called citron de Menton and some of the oldest avocado trees in the area. In 2006, he opened Mirazur, which earned its first Michelin star within a year and a second in 2012—in addition to numerous other accolades for both Colagreco and the restaurant. Following the success of Mirazur, Colagreco opened several restaurants around the world including French Riviera cuisine at AZUR in Beijing in 2016, Japanese teppanyaki-style Grill 58 in Macau in 201, and the recently opened Florie's at the Four Seasons Resort Palm Beach. Colagreco also has plans to open a new eatery in Bangkok later this year. A good piece of toast with butter and Comté cheese aged 36 months. I love to spend my day off at home in Menton, France, with my wife and kids. I usually have a good strong cup of coffee and, if I am particularly hungry, I take a couple of eggs from the henhouse in my garden and cook them to eat with toast—nothing better to start the day. I believe in good food, whether it is brunch, a hamburger or gourmet cuisine. The best brunch is at my friend Marcel Ravin's place, Blue Bay at the Monte-Carlo Bay Hotel & Resort. My fridge! I always have some fresh milk in case I am hungry at night. And a piece of dark chocolate. My local coffee shop is called Bar Canada, set in Ventimiglia, Italy. I always order a good Italian cappuccino just after I go to the local market. I go to Buenos Aires and La Plata, Argentina. I love Parrilla Don Julio because they cook incredibly good meat, Narda Comedor for breakfast or lunch and Tegui for dinner. Pasta with garlic and extra-virgin Taggiasca olive oil. A vegetable or a fruit from my garden, like a juicy tomato, a good carrot or a sweet tangerine. Dark chocolate—it is delicious and healthy! This article written by Marisel Salazar first appeared on the MICHELIN Guide digital platform. View it here. The professional 'sfoglina' gives a detailed guide to the art of fresh handmade pasta.